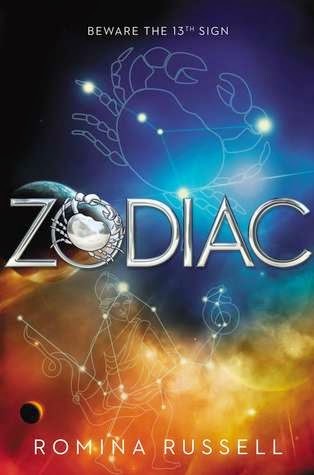 I can't think of any other books that use the Zodiac as a part of its core mythology and world-building but Romina Russell's take on it was equal parts familiar and fascinating. At least, it's familiar if you've ever looked up what your sign says about you (and I have). In Zodiac, there's a galaxy made up of 12 Houses, each named after an astrological sign and the heroine, Rhoma Grace, is from House Cancer. Each House has defining qualities and everyone is expected to learn their House's history and most importantly, learn how to read the stars to make astrological predictions. Rhoma, better known as Rho, doesn't use the scientific methods taught to students like herself. Instead she can look into the sky and read the stars with her instincts, which makes her very special. So when a violent, unprecedented blast strikes Cancer killing thousands of people including Cancer's Guardian (a leader akin to a monarch), she is chosen to become the next Guardian and despite her fears she accepts because she loves her House and its people. Since my sign is Cancer, I loved having this in common with Rho and learning about her House in particular. Cancer is associated with words like caring, loyal, nurturing, protective and emotional and that's certainly the case here with Rho. She's just this sixteen-year-old girl but despite witnessing the destruction of her House and not knowing the whereabouts of her own family, she steps up even though she has no idea what to do. But what I admired most was that Rho trusted her gut even when more experienced people wanted to call the shots. So when she sees in another reading of the stars that other Houses will succumb to the same fate as Cancer, she gives into her instinct of finding out why and warning the other Guardians to protect their people. Through some digging, she suspects that Ophiuchus, the alleged and exiled 13th House, has returned seeking revenge on all the Houses. Rho, along with her appointed Royal Guard Mathias and Hysan Dax, an envoy from House Libra, join her as she tries to convince everyone that her suspicions are correct. Here's the thing, I loved the world, the overall story and the characters but I struggled with some of the execution. There is a TON of information to absorb. The different Houses, their attributes, their government, the technology they use, new people constantly introduced, the backstory on Ophiuchus, Rho's family, friend and more. I tried to keep up with everything because I think the details are important but at the same time, Rho's actual journey to warn the Houses dragged. She'd visit a House, they wouldn't believe her, she'd go to the next one and repeat (many times). As a result, I was very much aware of the length of the book because it almost seemed like Rho wasn't getting anywhere in spite of her efforts. And lastly, there's a love triangle. One that felt extremely unnecessary in light of everything else already going on. Granted both guys are great - I loved Mathis and Hysan - but "the one" for Rho was obvious from the start and I think it would've been better to really build that relationship (which didn't happen as much as it should have) instead of dividing her time between the two. As I said, I love the premise and I am in awe of the author's imagination! It was so clever to intertwine known traits about the different Zodiac signs with her own twist. I think it's worth giving a shot because I see the potential for the series' future books. I loved the premise and description as well! I felt there was a bit of info-dump as well in the beginning. I thought the love triangle was unnecessary, but I was just so fascinated by the world-building and the world in general. Awesome review, Rachel! If I ever decided to give Zodiac a shot, it would be because I'm fascinated by the idea of using the Zodiac signs as part of the book's mythos. However, your reservations are definitely making me uncertain, so it'll probably go on the backburner for me right now. Glad you did find something about you liked though!